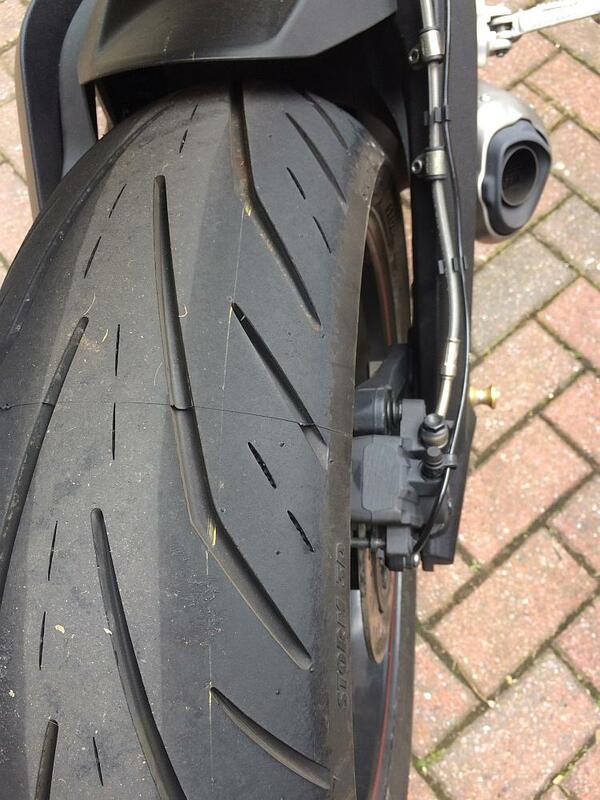 My tyres on the Street Triple have served me well, having done about 4500 miles. I know that doesn't seem a lot but they are after all super sticky, super soft Pirelli Supercorsas. When I think of the punishment I gave them in the form of full throttle take offs and sometimes extreme cornering and braking with the aid of Brembo brake callipers then it ain't bad really. It's not the first time I have changed tyres on this bike. Last year I fitted Continental ContiMotions for a Spanish trip of some 3000 miles. This would have destroyed the Pirellis which had done 1500 miles already. 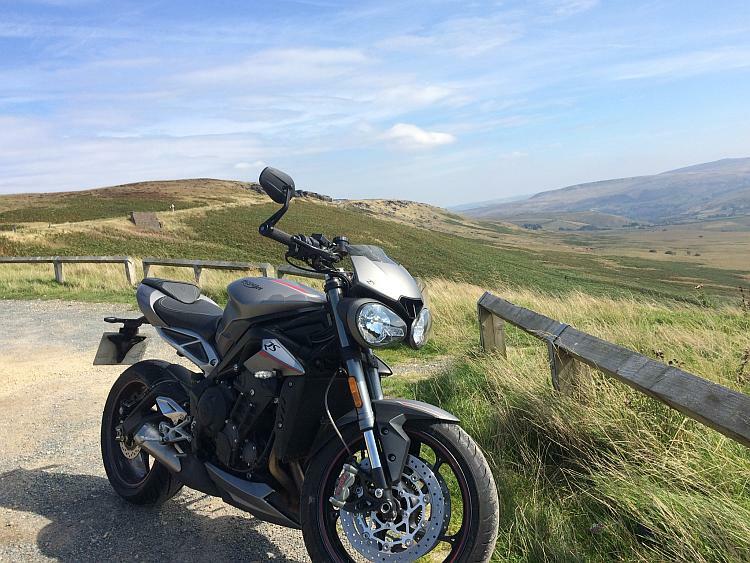 The logic was to refit the sporty tyres when I returned so I could enjoy the benefits of them around the fabulous north west of England, Wales to the west, Derbyshire to the south east, Cumbria and Yorkshire to the north of me. In September 2017 I purchased a set of Avon Storms cheap in a sale and thought I would have fitted them later in 2017 but as it turned out it would be 12 months later. I've been experimenting with a tyre changer that I bought. I've changed the clamp jaws so that they clamp the wheel rims better without damaging the coating. I had already bought parts and made the two bars needed to remove and refit the tyres easily. Ren and I had already fitted two new tyres to Sharon's Kawasaki Z250SL with ease and now it was my turn to re-boot my bike. So after work one night I I got stuck in and the whole job of removal and fitting the new tyres went really well and took about an hour and a half. As is usual the new tyres have completely changed the characteristics of my bike. Now it corners very differently, the straight line twitchiness has gone and it feels a lot more composed in a straight line going over imperfections in the tarmac. 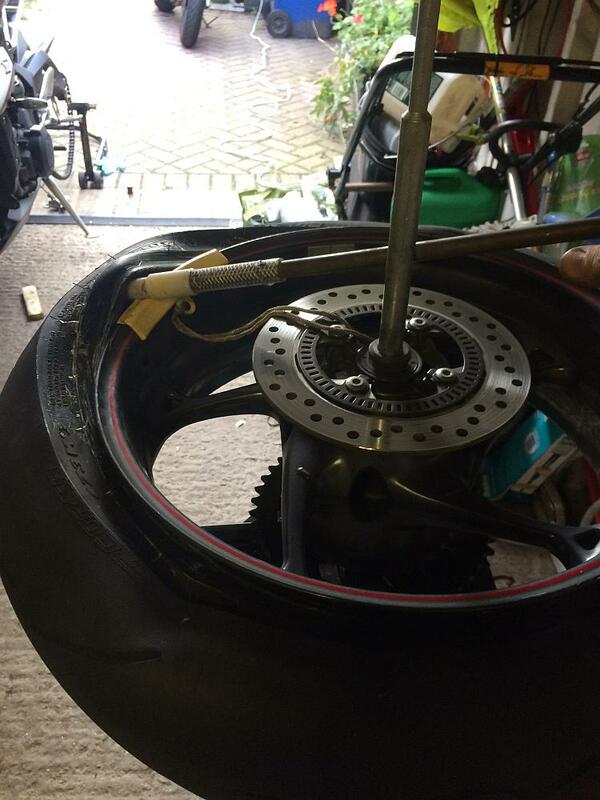 Rear tyre on,and static balanced, just have to peel off the sticker. Front one fitted, and balanced just have to refit the calipers. This road is the A640 to Huddersfield and has all the twistys over 25 miles of stunning scenery, this scrubbing in business isn't bad at all eh???????? Job done, well enough for now. This is as far as I dare bank the bike over at this stage, note the different compound in the centre of the tyre which is a harder than the outsides. How far did the Conti's last Latchy, and how did they compare when new to the Avon's. Been over the A640 many times now as it is one of my routes from Huddersfield to Wrexham sans motorways, the other was going south via Holmfirth or Meltham over the Peaks and down to Macclesfield. If I have to take the long way round I may as well make it an interesting route. The view point your bike is at, looks familiar, wouldn't normally have an ice cream van parked in it would it. Nothing like a 99 after some twisties. Must admit I like the route even more since I replaced the original tyres on my bike with Michelins. With my delicate style but a lot of motorway miles with a lot of luggage I'd estimate 8-10k for the rear and 12-14k for the front. Of course this depends on your riding style and your bike. In terms of my opinion on them - I must be happy as I've fitted another set. I'd suggest they're "good" but not fabulous. They're a budget tyre - they do what a tyre ought to do but they're not going to win any races. 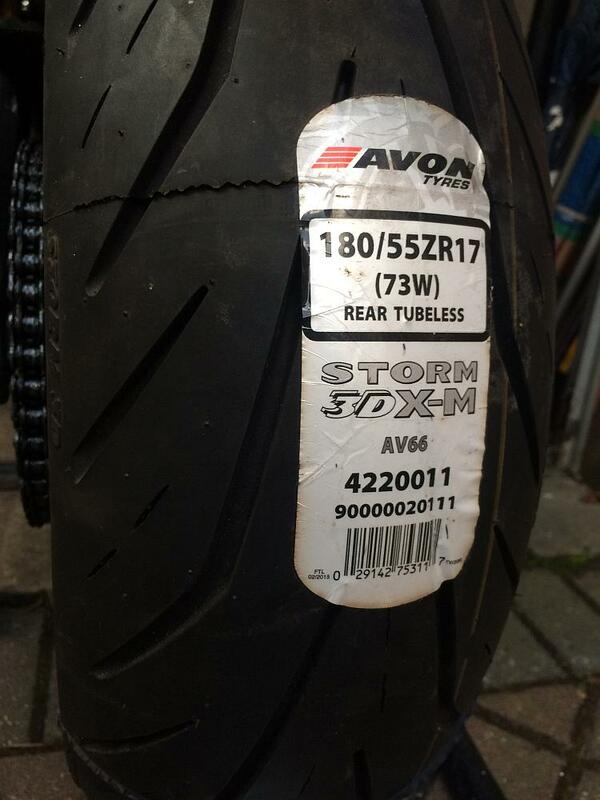 I was really worried about riding off with two new tyres, especially as it was torrential rain the day they got fitted. They felt absolutely fine, no scary riding on ice feeling. I didn't experience anything special either so put that down to the rain. Next outing was dry so I was ready to "feel" the difference. I felt well err nothing. I am not sad about this because I was perfectly happy with my old tyres so the fact the new ones felt the same was good. I do not know if this lack of difference is because I change my tyres when they still have decent amount of tread on them or I am a complete insensitive soul. Gosh all these bikers in my back yard so to speak. Go meltham down the woodhead. Then over the reservoir to Glossop. Glossop over to Hayfield then run over chapel to Whaley bridge. Long hill. To the top then down to buxton Harper hill over to the cat and fiddle drop in to Macclesfield. When I changed mine, last time home just before we met up I did begin to worry, then thought to myself. Wait a minute, when I got it it had 2 new Chinese Hong Kong Fuey tires on it and I was fine why am I worried about this time. Just take it easy for 100km or so you divot. And so I did, and every thing was fine, and now I can go around corners without having to be perpendicular to the road surface. Pete: I think that is the route the boy and I took a while back, Feb or April. We went down to some reservoir near Glossop. He headed back to Bradford and I continued to Wrexham, didn't go over the Cat and Fiddle though, I kept on the A 537 I didn't realise how near the Cat and Fiddle was or I would have had a gander. Or even the road running parallel to the A537. Map just cleared up a bit and I realised that is the Cat and Fiddle road. I'm much better with charts as against maps. Sharon had heard all the stories about bikers being thrown from their newly tyred rides. What she probably didn't realise is these riders were likely riding like lunatics on fresh rubber. 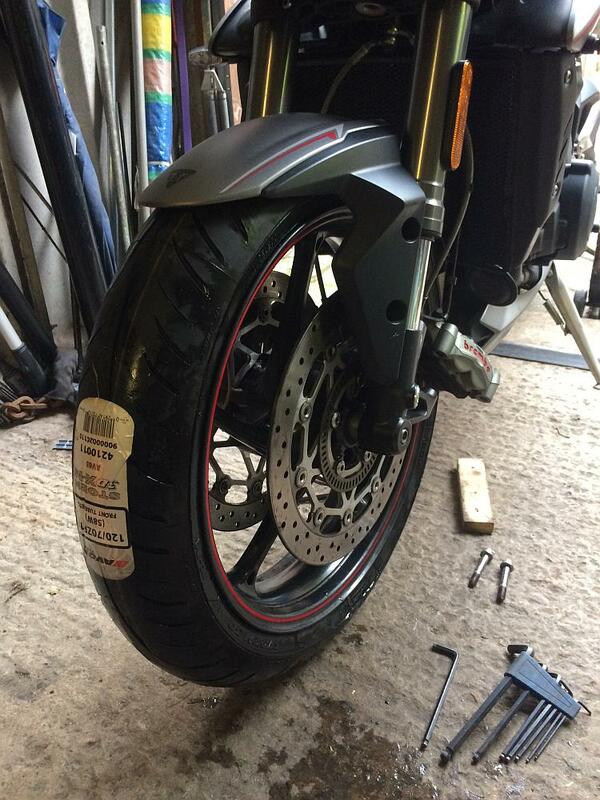 Fresh rubber isn't dangerous or lethal - as long as you ease the tyres in over the first 50 or so miles. I'll add a link to a very old post. It reminds us that if you do those first 50 miles on a motorway for example the centres will be scrubbed in but not the sides or edges. The idea is to gradually increase the angle of lean. Ok Borsuk, I think I have done about 4000 miles on the contis, they are less than halfway worn, I'll be refitting them for another Spanish tour next year, hope this answers your question.